In Benito Cereno (1855) Melville introduced the words "pretty" and "truly"when transforming the narrative prose of his source into dialogue. Where Amasa Delano had called assault with a knife "rather serious sport" (not the child's play represented by Benito Cereno), Melville made his Delano say, "Pretty serious sport, truly." "I told him it appeared to me to be rather serious sport, as the wound had caused the boy to lose about a quart of blood." "Pretty serious sport, truly," rejoined Captain Delano. I saw this and inquired what it meant. In amazement, Captain Delano inquired what this meant. 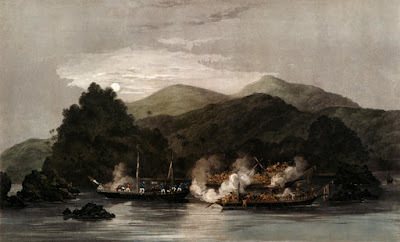 Added by Melville to his source, just in this short bit: Delano's "amazement"; calling the Spanish captain by his first name, "Benito"; Benito's "pale" appearance and defeated manner of speaking when he "dully muttered" his reply; and the substitution of "lad" where Delano reported "boys." So what? is the next question. In answering or say pre-answering, I don't automatically have to knock the work of Amasa Delano. Even the best old-school source studies have on occasion devalued source texts for no good reason, beyond perhaps a perceived need to absolve Melville from the sin of plagiarism. Writing on Melville the Poet, page 130 in The New Cambridge Companion to Herman Melville, edited by Robert S. Levine (Cambridge UP, 2014), Elizabeth Renker urges "a new approach" which at its best might helpfully check groundless discounting. Personalizing through names, thereby inviting more empathy. Particularizing with descriptive details. Most obviously, added details help develop character and plot. Some embellishments also work to humanize dubious, possibly devilish characters. (Here, Benito Cereno the captain of a slave ship as "pale" and pitiable sufferer.) Melville's singular "lad" replaces Delano's undifferentiated grouping. No longer just one of the "boys," Melville (or Melville's Benito) particularizes and familiarizes the assailant, now a "lad." Ennobling. As in Israel Potter, a similar project of rewriting, descriptive additions can work to ennoble the person described. Here the suffering Benito, elsewhere Delano and Babo. The ennobling effect applies to others, too, not only major players. Even with splendid digital resources and Melville's writings swelling the PUBLIC DOMAIN, it's a great blessing for scholars to have a haven in print--meaning in this case the 1987 Northwestern-Newberry Edition of Melville's Piazza Tales and Other Prose Pieces, 1839-1860. 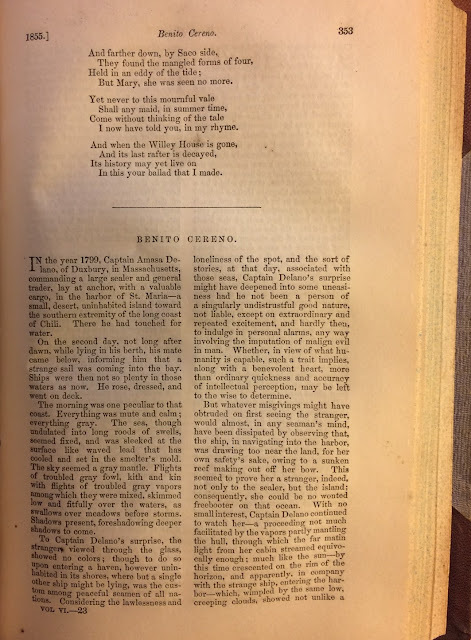 Amasa Delano's Chapter 18 is there for ballast in the back, reproduced with handy marginal cross-references to the main text of "Benito Cereno."